When I set out to create a few Christmas cards for my workshop this month, I wanted one to portray elegance -- the epitome of posh. I am totally in love with Stampin' Up! 's Vintage Wallpaper Embossing Folder, and thought it would work wonderfully well with the tree from the Snow Swirled set. I was right! The card, while appearing to be fairly complicated, is really quite easy and fun to create. Fold a 5 1/2" x 8 1/2" piece of Naturals Ivory card stock in half, creasing well with a bone folder. Run a 4" x 5 1/4" piece of Night of Navy card stock through the Big Shot inside the Vintage Wallpaper Embossing Folder. Rub this embossed piece with the Embossing Buddy. Ink up the brayer well with VersaMark Ink. Lightly roll the brayer over the raised embossed surface. Continue reinking the brayer and running it over the embossed piece until all the raised surfaces are equally shiny with VersaMark. Be careful to not push on the brayer too hard; you don't want any ink to get onto the non-raised surfaces. Just skim the tops of the design. Sprinkle inked surface with Gold Embossing Powder, tapping excess powder back into its container. Use the Heat Tool to emboss. Be sure that all embossed surfaces are shiny and set. Adhere the embossed piece to the card front. Rub the Embossing Buddy well over the surface of a 2 1/2" x 3 1/4" piece of Naturals Ivory card stock. Use VersaMark to stamp the tree. Cover the tree with Gold Embossing Powder, and use the Heat Tool to emboss. 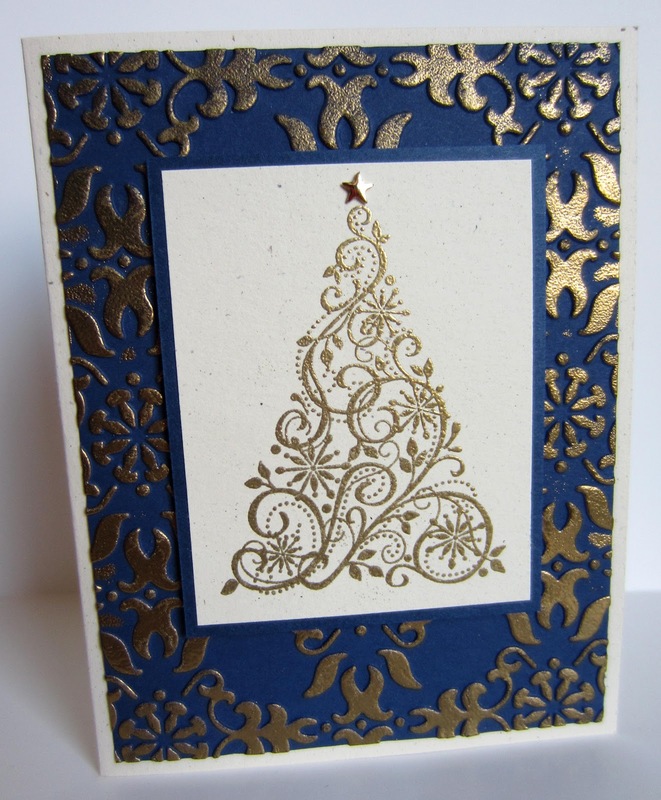 Adhere the embossed tree piece to a 2 3/4" x 3 1/2" piece of Night of Navy card stock. Attach this finished panel to the card front with Stampin' Dimensionals. Add a metallic gold star to the top of the tree. What a beautifully elegant Christmas card! That brilliant blue with the gold is very rich! So pretty, thank you for sharing the card recipe and instructions! It's a gorgeous card. I love the blue and gold. I Tweeted this out for you, I love this! Classic elegance at its finest! Thank you for the great share. This is so beautiful. I've never tried heat embossing, but recently got a dry embosser and looking forward to using it to make cards. Thanks for the inspiration! Love this card, so elegant! Thanks for sharing this Linda on "I Gotta Try That"
Beautiful card- so stylish and festive. I'm your latest follower from the Thursday Favorite things blog hop so come over and say hi! Today I'm making Christmas cards over at my blog so let me know what you think. A very beautiful card. I love blue/silver and blue/gold color combinations. I'm stopping by from Katherine's Corner blog hop. Swirls and Embossing..some of my favorite combinations! I love the look of embossing! Those powders are some real fun to play with too! thanks so much for joining us for Pearls and Lace Thursday! Oh my goodness!!! This is really beautiful! I've always wanted to make our own cards but couldn't get them to not look "crafty" and homemade. You've inspired me to maybe try again. Thank you so much for sharing at our Holiday Happenings link party and have a Merry Christmas!